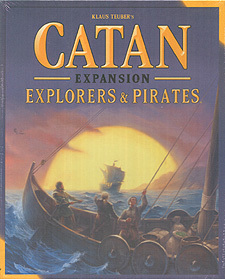 Catan: Explorers & Pirates includes 5 novel scenarios, each of which build upon your previous experience. All are easy to learn, rich in character, and lots of fun. In each, you explore an unknown sea by ship and build settlements on the discovered islands. Scenario 1 ("Land Ho!") introduces you to valuable harbour settlements, shipbuilding, exploration, and over-seas settlement - the most important basic rules of this expansion. Each subsequent scenario introduces a new mission and its simple new rules. The game culminates in Scenario 5 ("Explorers & Pirates"), which incorporates all of these very rich new themes in a diverse and exciting campaign of bold exploration and piracy! Explore Catan! Build harbour settlements, ships, settlers, and sailing crews and set out across mysterious seas in search of new lands, spices, fish, and gold fields. You must have the Catan board game in order to use this game expansion.